Panasonic has recently introduced their Lumix DMC-TZ50 digital camera. 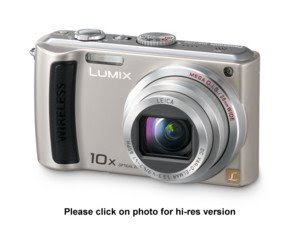 The Panasonic Lumix DMC-TZ50 has Wi-Fi capabilities so users can upload their pictures to Picasa Web Albums. The Panasonic DMC-TZ50 has a 9.1 megapixel, 28mm wide-angle lens, 10x optical zoom and HD video recording capability. The HD video recording capability of the Panasonic Lumix DMC-TZ50 is at 720P, however, it doesn’t have an HDMI capable, you can only connect it to your HDTV via component cable or by inserting your SD card unto your Panasonic HDTV. Furthermore, the Panasonic DMC-TZ50 has a large 3 inch screen where you can preview your pictures. Standard camera features on the Panasonic Lumix DMC-TZ50 includes: Intelligent exposure, auto red-eye reduction, Mega O.I.S, Intelligent ISO, scene selector, face detection, and continuous auto focus. The advantage of having a Wi-Fi capable digital camera is that whenever you’re on vacation and you run out of space on your memory card, you don’t have to delete any photos. You can conveniently upload your pictures to Picasa Web Albums using T-Mobile’s HotSpot service. You can even browse and delete any pictures on your Picasa Web Albums right on the Panasonic Lumix DMC-TZ50. The Panasonic Lumix DMC-TZ50 will be available in May for a suggested retail price of $449.95.